Blueberry Cornbread – this easy cornbread recipe starts with a doctored mix. The blueberries and some added sugar make this the PERFECT breakfast or dessert recipe. This week has been totally cray, as my daughter likes to say. Between re-entry from a week long trip to Wisconsin (to see some friends and attend a video workshop) and Jordan’s birthday this weekend, my calendar has so many things on it it’s hard to read. On weeks like these, it’s really hard to get anything done besides work. So when dinnertime rolls around, I start staring blankly into my refrigerator, thinking about the chicken that’s still frozen. Please tell me I’m not alone in that?? One of my favorite last minute dinners is actually breakfast. Brinner, as we call it, appears a lot on busy weeknights when there’s too much going on. It only takes a few minutes to scramble some eggs and brown up some bacon. Add a side of fruit or throw some leftover veggies in your scramble and you have a well-balanced meal…unless you’re me and Jordan. 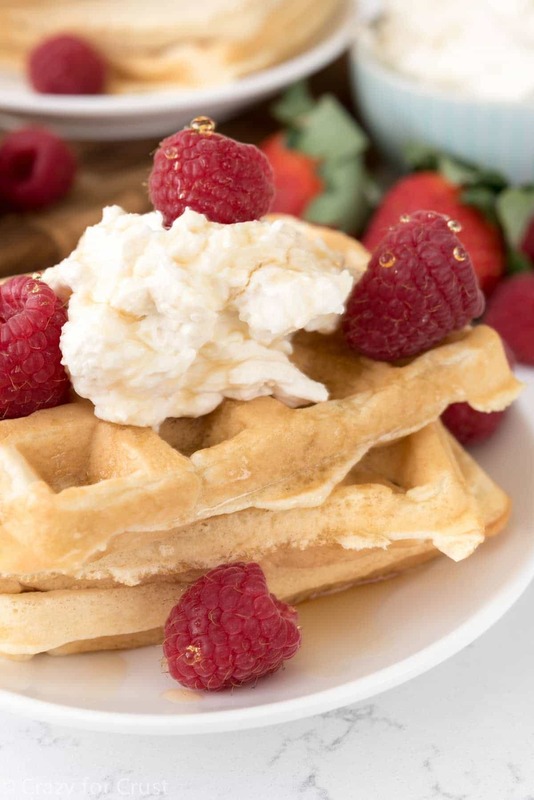 We also require something sweet with our breakfast-for-dinner. Sometimes I’ll make pancakes or muffins, but when I’m feeling even more in a pinch, I’ll make cornbread. 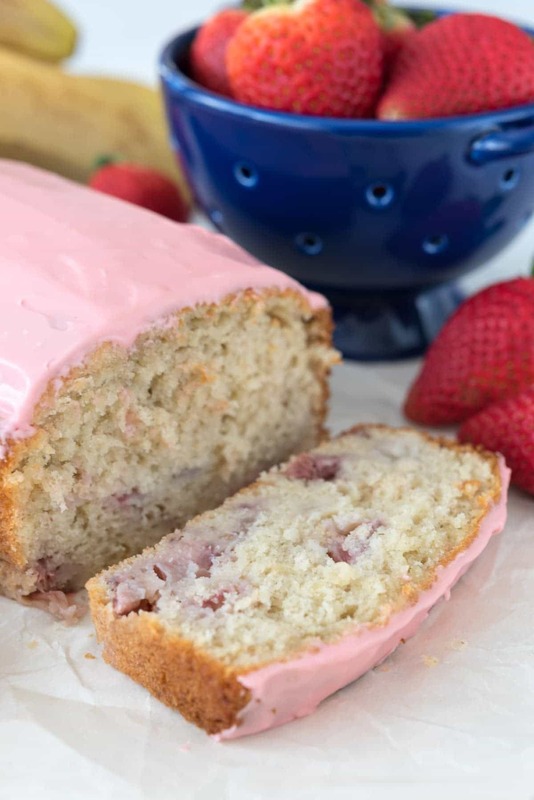 It has just a few ingredients and bakes up in a pan so there’s no scooping or flipping. One of my favorite cornbread mixes is Krusteaz Honey Cornbread mix. It’s easy to prepare (just one bowl and a few minutes) and it’s moist and delicious. I love to doctor it just a little, because we’re sweet freaks, so I add a bit of brown sugar to make it perfect for us. 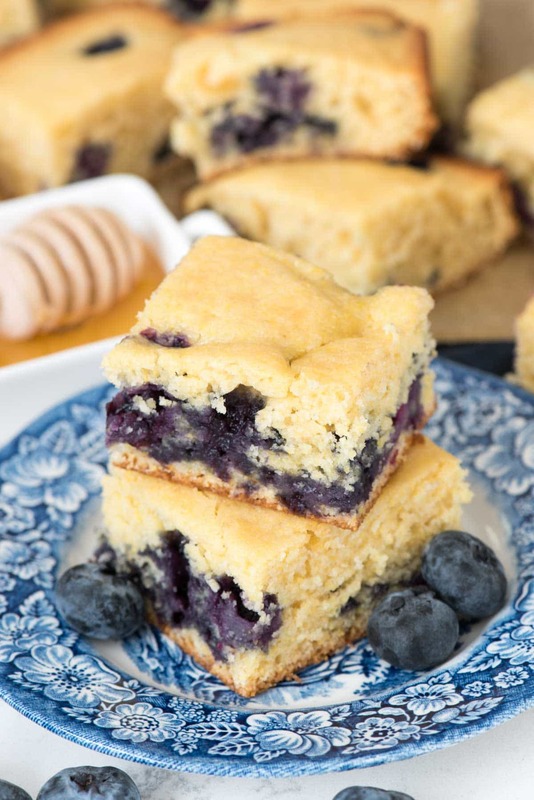 I don’t stop there though; we love to add blueberries to our cornbread too. They taste just like blueberry muffins, but with that telltale cornbread flavor. If you’ve never added blueberries to your cornbread, you’re missing out. 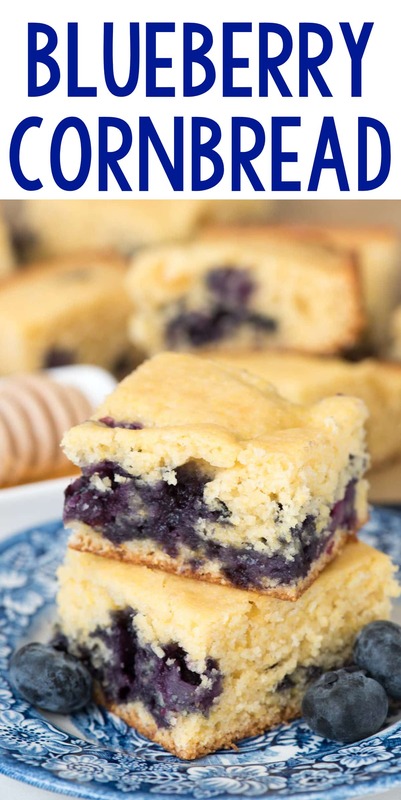 Blueberry cornbread is unbelievably delicious! You really should start ASAP. 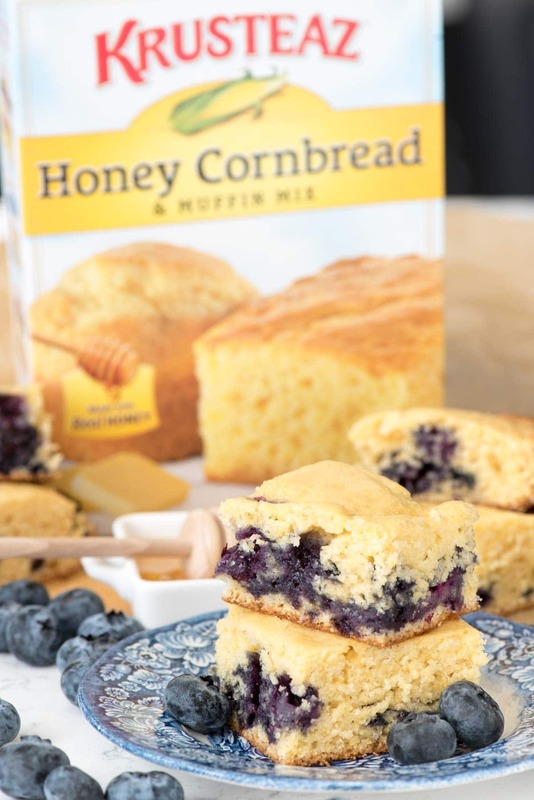 Blueberry cornbread is not only great for a sweet breakfast treat, but we eat it like cake, too! It’s one of the best cornbread recipes we’ve ever eaten! EASY Blueberry Cornbread - this cornbread recipe starts with a doctored mix. The blueberries and some added sugar make this the PERFECT breakfast or dessert recipe. 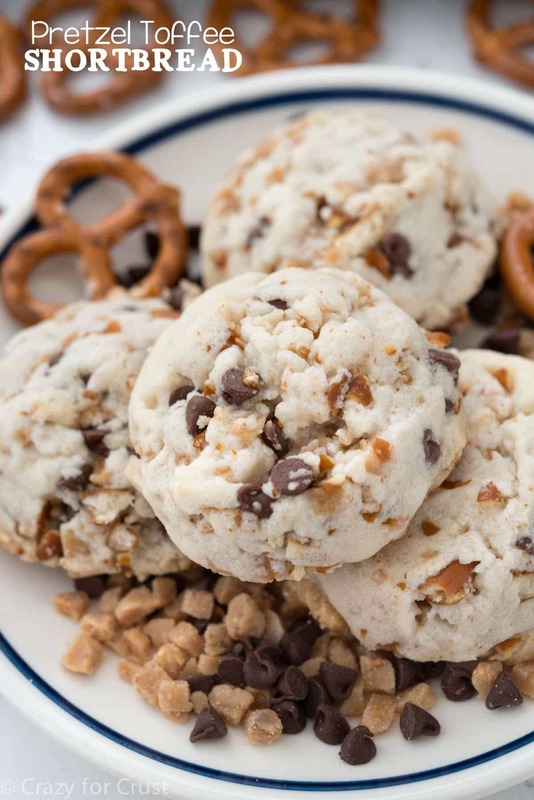 Click here to get the FULL PRINTABLE recipe. My boyfriend just bought some blueberries so these are perfect! Thank you! I love easy box recipe hacks! Perfect for a weeknight. Great idea to add blueberries! I’m crazy about blueberries! This cornbread has my name written all over it. I’m a huge fan of breakfast for dinner! Looks delicious! I used to work at Whole Foods in the bakery department. We used to make this all the time. The cornbread would come in big 5-gallon buckets already mixed up into batter. We added the blueberries and then spread it out in the pan and baked it. Soo good! Raspberries are also good and always make an appearance in our cornbread for Mother’s Day muffins.